Since I moved to the U.S., Thanksgiving has become my favorite holiday. This year I’ll be celebrating it abroad, heading to the United Kingdom to see family and friends after a quick work trip to Geneva. (I’m receiving an award at the United Nations!) We don’t have anything like Thanksgiving in England, where I grew up, but food has always been a huge part of how the people in my family relate to one another, and to others in the world. From an early age, my mom taught me by example how to use food to build community. She’d invite strangers home for meals, or make breakfast and tea for all the garbage men. (Some days we’d have four garbage trucks parked in front of the house.) On the anniversary of her father’s death, she took donations of drinks and food to charity shops or to the children’s hospital. I remember us all as a family—my mom, dad, my brother, cousins, and other family members—together in 1995, sitting at home in the living room. It was the holiday season, and of course mom had made a big meal. The house smelled of warm spices and home cooking. I can almost hear my mom’s loud, confident voice (she was life of any party, and usually the most dominant voice in the room) asking, “Where we will all be five years from now?” But the next year she passed away suddenly, from a blood clot, at the age of 46. I was traveling in the states at the time. When I got the news and flew home, my brother Raine was the one who picked me up from the airport. Let me rewind for a minute to explain that my relationship with my brother has never been perfect. All too often we were in different cities—or different countries!—as well as on different paths. We’ve always loved each other, but we used to fight a lot. My mother always emphasized the bond between us, as brothers, and we were there for one another in many ways from an early age. As two brown kids, we stood out in our almost all-white hometown. We wore our hair long as Sikhs. On top of that, our mother was ill for some years, especially when we much younger. There would be stretches where she’d be in hospital for weeks or even months at a time. When she was home, she was usually in the kitchen cooking, singing, and telling stories. I loved to help her cook, which I learned more or less by watching, while my brother was outside helping my dad fix the car. When my mother became very ill, there were times we had to cook for ourselves. As we got older, my brother and I drifted further apart. We had different interests, different friends, different jobs. It felt like we didn’t have much in common, except for our shared history and heritage. But a few months ago, after I had an idea for a recipe, I went on Facebook to see my brother had posted a photo of a dish he’d made—and it was almost exactly the same design. I was reminded that we’re more alike than it seems on the surface. Thanks to social media, I’ve watched a lot of my brother’s life unfold from afar. And of course, because he’s older, four years of his life unfolded without me. He was born in Uganda and almost immediately became a refugee baby. He was only around 9 months old when he came with my parents to Britain. Fleeing the fascist government, my mom and dad could only carry minimal possessions. My mother put some of her wedding jewelry in my brother’s diaper because it was something she could take across the borders without being searched. The government had taken all their money and property. About 39 years later, we took a family trip to Uganda for my brother’s 40th birthday. By this time, I was living in the U.S., going to school in North Carolina. For Spring Break, I suggested we meet at London airport and fly to Uganda, to the place where my brother was born. We grew up hearing many stories about this town, from the tropical warms summer rain that would fall during the day to how mom and dad would sit outside eating mangoes. Often they would mix traditional Indian foods with East African ingredients. My mother told us of the Maasai people (a warrior tribe of Kenya), who would come on the trains and sell vegetables to local families. She told us about a water well my grandfather built with his own hands so people passing in the heat would have fresh water to drink. In recent years, Raine and I have more or less grown out of our bickering and embraced our brotherly roots. On my last visit home, I went straight to the pub where he had set up a pop-up food stand. He came to cooking after having a lot of dissatisfying jobs. I had just come from visiting my old school teacher Mr. George. My brother came out with a dish—a South Indian-style Dosa curry—with some homemade sauces. I really wasn’t expecting it to be as good as it was. It not only looked good, but it tasted good as well, a sort of explosion of spices in the mouth. I was a little reluctant, but I had to compliment my brother. I noticed how he talked to everyone he cooked for. He had built relationships with people, and they weren’t just coming for his food; they were coming to see him. If anyone was going to start a career in food, I thought it’d be me. I had certainly picked up the skills and the family recipes from my mother. But what I realized that day was that my brother had picked those things up as well. 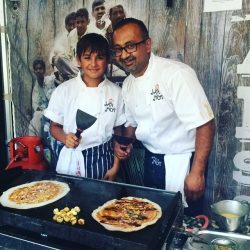 A few weeks ago my brother entered in the finals of British Street Food awards, the largest street food competition in the world. He made it there by following the advice his then 10-year-old son, Jack, gave him three years ago: Follow your dreams. Jack suggested making food for people, because he could see that was something his dad loved doing. Wise words from such a young fella. (It started as that simple idea cooking food at the local pub, and built up from scratch.) Raine didn’t win the finals, but I’m incredibly proud of him for coming so far in less than three years. He now has one the best food trucks in the nation, recognized as one of the top 17 street food vendors in the country. He’s also a local champion for food cuisine, promoting fresh produce from local farms. He teaches prison inmates how to cook Indian food, and donates a portion of his proceeds to charities for children, one of my mother’s favorites. He still uses some of her recipes. When I return from Europe, I’ll be making a meal for 100 diners for an event that supports local farmers in East Tennessee. In preparation, I plan to spend three days with my brother to learn some new dishes. Although Thanksgiving is of course a U.S. holiday, I can’t think of anything I’d rather do than spend it with my big brother, cooking, talking, reminiscing, and reconnecting. Family, community, and a sense of togetherness is something that’s just intrinsically tied to cooking, food and storytelling. They teach us about what we have in common—the things we share even when we think we are very different. They help us remember loved ones who we’ve lost. Food brings us together in so many ways.